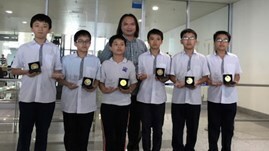 A delegation of ten Vietnamese students from Hanoi-Amsterdam High School for the Gifted have won gold medals at the Asia-Pacific Mathematical Olympiad for Primary Schools (APMOPS2015) held from May 28-31 in Singapore. Teacher Pham Thu Le from Kinderworld Education Group said they are among 500 outstanding students qualifying the first round of the contest. Six Vietnamese gold medalists are Le Quang Huy, Ngo Le Bach, Tran DinhQuan, Truong Tuan Nghia, Le Tran Cong Hung and Nguyen Manh Quan. In the team category, Vietnamese delegation ranked second after Chinese team. The contest’s second round attracted 264 students from 14 nations in the Asia-Pacific region. The annual event is held by Hwa Chong Institution in Singapore.